Our fleet of 5 ton straight trucks are equipped with tailgate delivery systems to effectively load and unload your skidded freight when dock level doors are not available. We can navigate tighter city pickup and delivery conditions where traditional tractor trailers would not be able to serve your requirements. 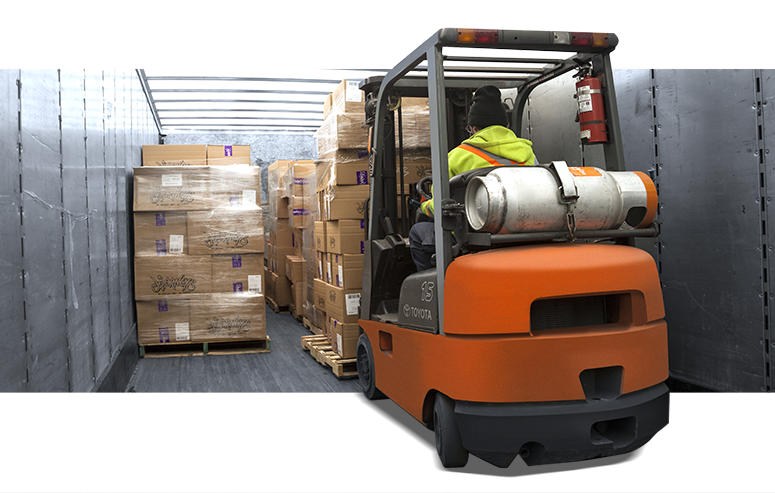 Where larger, multiple skid shipments are required and dock level access is available, we have tractor trailers available for your truckload, and partial truckload shipments. Shipments called in by 11 a.m. are delivered by 5 p.m. in the same business day. Delivery within 3 hours from the time we receive your order. Pickups called in by 3 p.m. are picked up and delivered the next day by 5 p.m.
We provide an easy to understand, per skid pricing schedule. We have a minimum price for pickup and delivery of the first skid. We then pass on the savings to you and charge a fraction of our base price for additional skids picked up at that time. This applies to all service levels including our 3 Hour, Same Day and Overnight options. Throughout our service area, we offer scheduled LTL and truckload service within the Greater Toronto Area (GTA) and between the GTA and outlying areas. Our late model, tractor trailer fleet is well maintained and transports your dry goods of all shapes, sizes and descriptions. Retail commodities like fashion, sports equipment, leather goods, shoes, apparel, cosmetics and electronics are a specialty at QRC Logistics. We tailor programs to your exact requirements with delivery by 9 a.m, by noon or by 5 p.m. Remember, if our scheduled service and cut off times don’t work for you… we’ll create a solution that does!